BBC Sport will bring audiences all the action live from the Glasgow 2014 Commonwealth Games across TV, radio, online and mobile from 23 July. Including more than 300 hours of network TV coverage, 200 hours of radio coverage and over 1,300 hours of live action via up to 17 digital streams, this will be the most comprehensive BBC coverage of a Commonwealth Games and Para-sports programme to date. Gary Lineker, Clare Balding, Gabby Logan and Hazel Irvine lead the BBC TV coverage on BBC One and BBC One HD. They will be joined by a stellar list of experts that includes Olympic gold medallists Rebecca Adlington, Michael Johnson and Sir Chris Hoy. Coverage will start at 06:00 BST on BBC Breakfast before live action gets under way at 09:00 and continues throughout the day until 22:30. At 22:40, Today at the Games brings you the best of the day's action and news. BBC Three and BBC Three HD will become a dedicated sporting channel for the Games, bringing audiences further coverage from 09:00-22:00. Glasgow 2014 will be BBC Sport's biggest ever digital Commonwealth Games, with up to 17 live video streams available across any device - an increase from six streams in 2010. 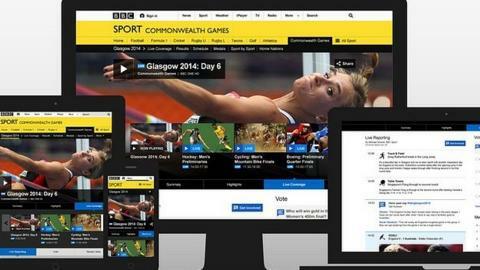 BBC Sport's Commonwealth Games website will have all the latest news, features and analysis. Audiences can also plan their viewing with our daily guide to the best of the action, as well as a full clickable event schedule, interactive medal table and results. Viewers will also have the choice of up to seven extra streams on BBC Red Button - depending on your receiver - while those with BBC Connected Red Button will have access to up to 17 streams. Radio 5 live will deliver more than 200 hours of action and breaking news to listeners during Glasgow 2014. Nicky Campbell will present the breakfast show live from 06:00. Then, from 10:00, 5 live's team will have extensive coverage throughout the day, with Colin Paterson rounding up the action from 23:00-01:00. Sports fans can follow the Games wherever they are by listening live via the 5 live website, the BBC iPlayer Radio app or the BBC Sport app. The best highlights and insight will also be available on the 'In Short' section of the 5 live website. BBC Nations and Regions news and sports teams will be following the Home Nations' successes closely, reporting on the stories and athletes from their cities and towns. In addition, the BBC News Channel's Commonwealth Games Sportsday will round up all the action from 23:40 until midnight on BBC One, BBC One HD and the BBC News Channel. Director of BBC Sport Barbara Slater said: "The Glasgow 2014 Commonwealth Games is one of the biggest sporting events of this year. The BBC coverage reflects our commitment to delivering great sporting events with the determination to continue the standards of broadcasting previously seen at Olympic Games." Complementing the BBC Sport programming, BBC Scotland will put on a series of cultural festivities, including 16 days of major events from a pop-up 'BBC at the Quay' and a raft of Commonwealth programming. Click here for more details about the 5 live schedule during Glasgow 2014. There will also be comprehensive coverage on BBC Radio Scotland,BBC Radio Wales, BBC Radio Ulster and across BBC Local Radio. NB All times are subject to change.